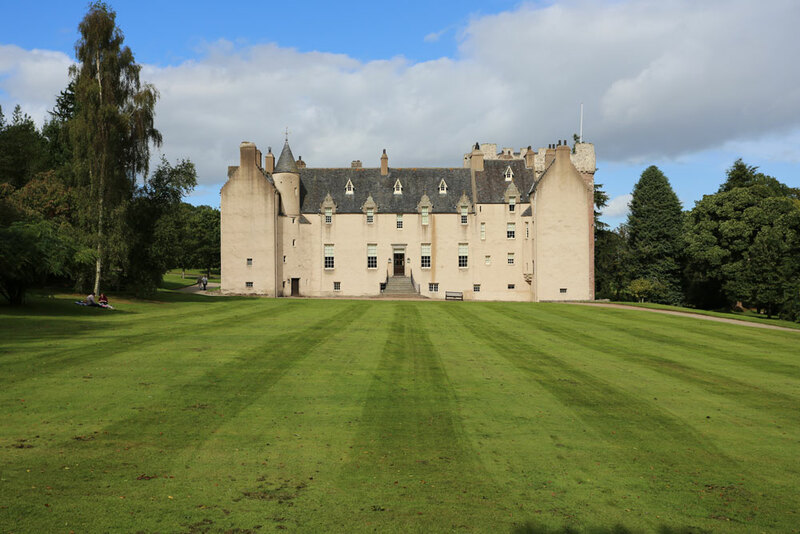 Drum Castle is one of my favourite places to visit in Aberdeenshire. 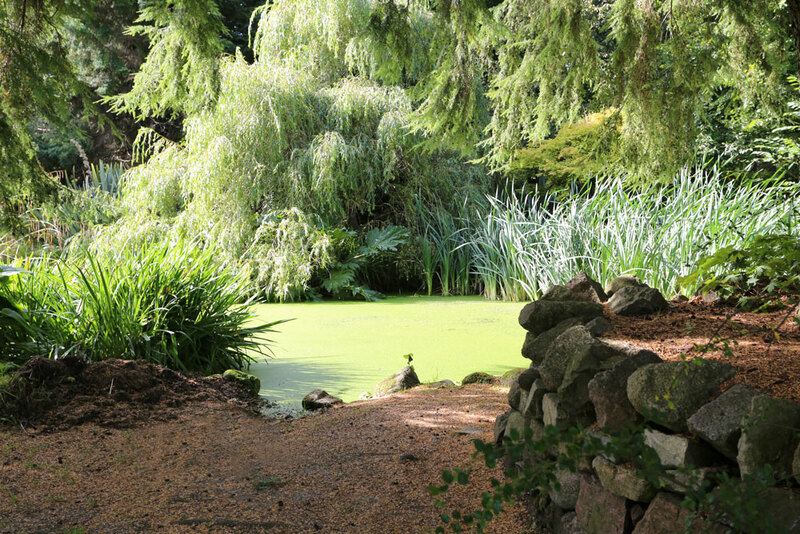 The grounds and especially the gardens are beautiful, for enjoying a nice afternoon stroll. In fact I recently staged a pre wedding photo shoot, inside the stunning Drum Castle Gardens. On my last visit, we watched the arrival of a bride, on an beautiful sunny Saturday, from the giddy heights of the Drum Castle Tower. Until this point, I hadn’t actually realised you could get married at Drum Castle. What a beautiful, historic, and romantic place to have a wedding. This revelation spurred me on to do some further research, about a place I was already very familiar, and put together a list of 10 things I think you will love about this wedding venue. 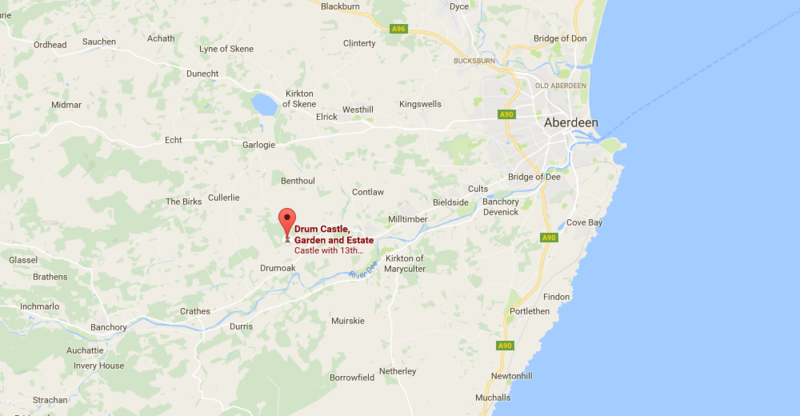 Drum Castle is situated a short 10 miles outside of Aberdeen. You get the best of both world’s here. The convenience of being able to drive back and forward to a major city, combined with the tranquility of a beautiful Scottish countryside. This will come in handy, as apart from a one bedroom courtyard cottage, there is no accommodation on the estate. You are spoilt for choice when it comes to hotels in the area though. Entire books have been written about the history of Drum Castle, so I will try and keep it brief with the highlights. King Robert the Bruce gifted the Royal Forest of Drum and the Tower of Drum, to William de Irwyn in 1323. You can still see the original charter with the Bruce seal intact. The Irvine family called Drum home for the next 650 years, until the national trust took over in 1976. The Jacobean mansion house extension was added in 1619, and throughout the 17th century, Drum was captured twice and garrisoned four times. The Irvine’s were Jacobites, and you can still see the chamber where the 17th laird hid from the redcoats, after the battle of Culloden. What a perfect place to add your own piece of history. The castle is one of the oldest tower houses in Scotland. It has a series of rooms you can explore, each containing beautiful portraits and Georgian furniture. If you are a lover of books, there is a 3000 volume library, with titles dating back to the 1500s. What’s great about all this, is you can arrange for your guests to have private tours, perhaps whilst you are being photographed. You can also have your ceremony and reception in the castle, but more on that later. 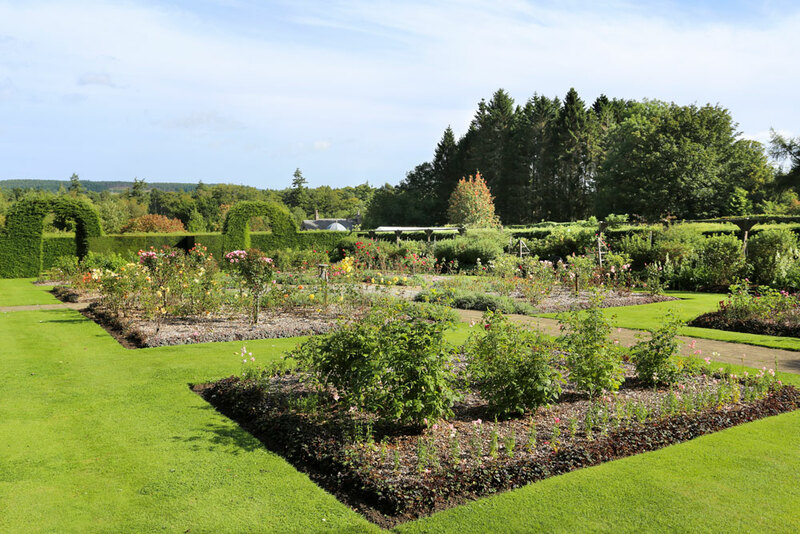 This is my favourite part about Drum Castle; the walled in gardens. A small fortune is spent annually, to create historically accurate rose gardens, from the last four centuries. I have been multiple times, across the seasons, and I am always surprised at the beauty, and also the lack of people there enjoying it. It’s a hidden gem that you really must go and see. Enjoy a stroll into the past, as you walk from century to century. Or look out over all four gardens, from the newly installed viewing platform. Like the castle, you can also have your ceremony and reception in here. A short walk across the lawn, takes you to the Drum Castle Chapel. Built in the 1500s, this charming little place has beautiful stained glass windows, and is surrounded by yew and holly trees. It is the perfect place for an intimate, religious wedding, with room for up to 50 guests. Should you require something larger, or non religious, you have the option of the drawing room or the library in the castle, or the walled garden. Each of these locations can accommodate up to 70 guests. For small weddings, the dining room in the castle is available for your reception. 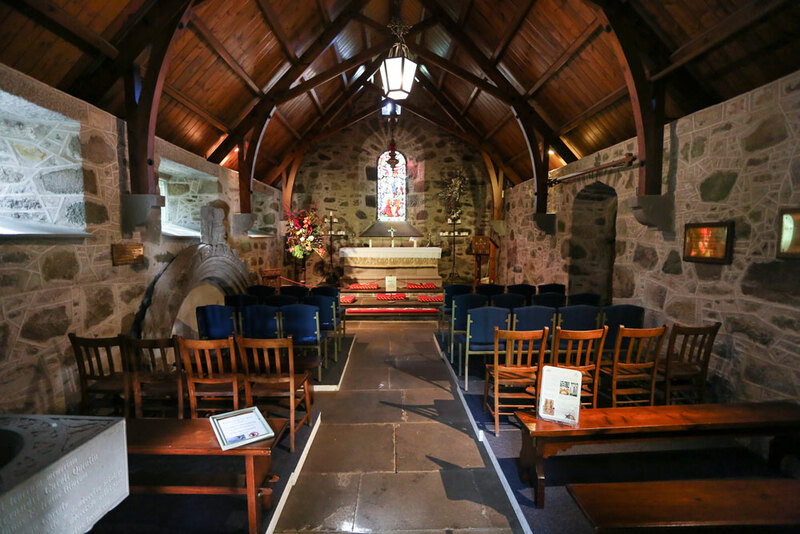 Like the chapel, this is an intimate space which can seat a maximum of 50 guests. If you are looking for something bigger, you can put a marque up on the lawn. There is so much room here, you could seat up to 500 people for dinner. I have friends who did something similar at Fraser Castle, and the marque was absolutely fantastic. 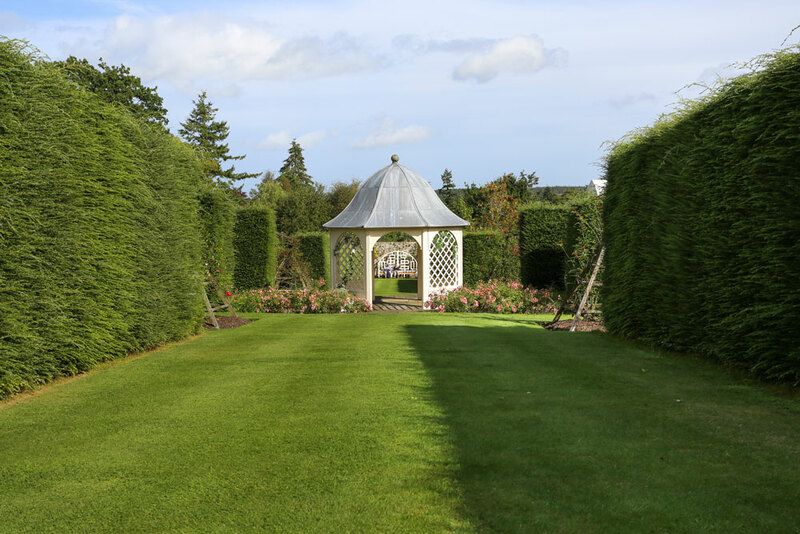 The walled in garden is not the only scenic part of Drum Castle. In fact the walk from the castle down to the gardens is really nice. Little statues and ponds decorate the pathways, and the grass is all nicely manicured. There is an ancient oak woodland, which has three marked walks. Probably not ideal for wedding guests, but perhaps a place for the best man to escape and practice his speech. Again perhaps not the easiest place to access, don’t even attempt it in heels, but if you can climb the steep 21 meter staircase, to the Drum Castle Tower, the views are to die for. The imposing defensive structure has three and half meter thick walls at the base. And if you can make it to the top, you can see for miles over the Deeside valley. I am absolutely terrified of heights, but as I said earlier, a bride arrived whilst I was at the top, giving me an incredible view of the proceedings. It was too good an opportunity, so I managed to open one eye, and take a look. This might not be something you think about on the day, but along with your memories, your photo’s will be so important. Of course the focus of your images will be you and your guests, but having beautiful backdrops can really enhance your pictures. Drum Castle has beautiful backdrops in spades. As a result, it is a dream location for professional photographers to shoot, and I never go there without taking my camera. Ok, depending on who you are, this might not be something you love. I am not a big believer in the supernatural, but I do like the mystery of it. There have been a number of strange sightings at Drum Castle. A female figure, believed to be Anna Forbes, the wife of the 20th Laird. The laughter of Alexander Irvine, who died as a child in 1865. And most recently, a mysterious mist captured by motion activated cameras, setup to monitor nesting swallows. I have just finished watching season two of Outlander. If you haven’t seen it, it’s about the Scottish highlanders and the Jacobite rebellion. The thought of getting married in an ancient Scottish castle, with so much historic significance, is really appealing. Drum Castle has so much to offer as a wedding venue. It has so much to offer as just a place to go and visit too. 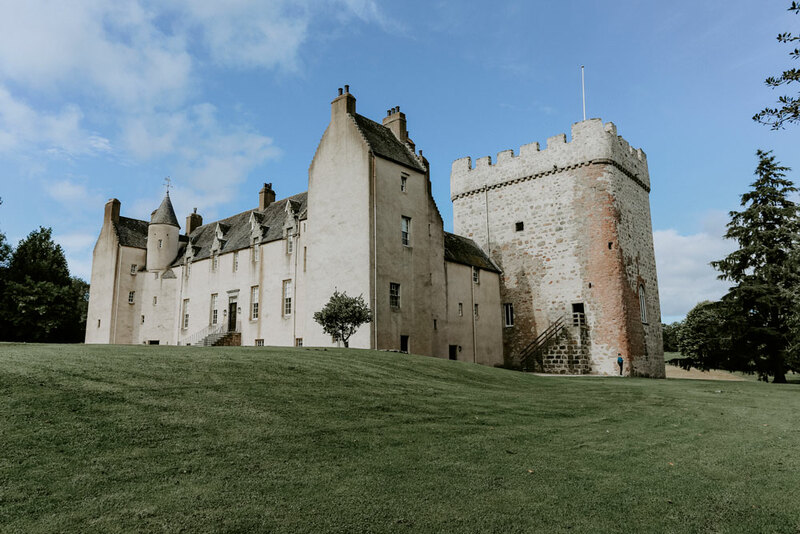 If you are looking for a patriotic and romantic place to get married, where the kilts and the bagpipes will feel at home, I would definitely take a look at Drum Castle.